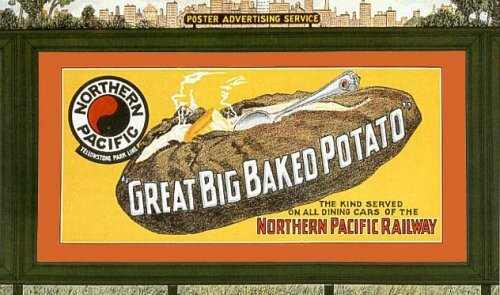 RAILROAD.NET • View topic - Northern Pacific: "The Route of the Great Big Baked Potato"
Northern Pacific: "The Route of the Great Big Baked Potato"
How this forum has ever survived without an homage to the greatest railroad foodservice promotion in history I will never know. But undoubtedly in the great halls of Railroad.net this is surely the place where discussion of the Northern Pacific's world famous Great Big Baked Potato and all such related things should occur. And now for a reminder of the origins of our tasty friend. Yeah, I ate one of those shoe-sized potatoes on the North Coast Limited. No matter what else you ordered with it, it's gonna fill you up. Very tasty, too. Desertdweller wrote: Yeah, I ate one of those shoe-sized potatoes on the North Coast Limited. No matter what else you ordered with it, it's gonna fill you up. Very tasty, too. Oh goodness....one year and we now have our first official reply to this thread. What was it typically served with? Was the Great Big Baked Potato considered a "side dish"? I had mine with a steak during May 1962 on #25 second night out. May as well said "hold the steak". Say, as in the NP was practically the only railroad that would accept verbal orders. I don't know if it was offered a' la carte. Gilbert B Norman wrote: May as well said "hold the steak". Say, as in the NP was practically the only railroad that would accept verbal orders. I wasn't aware of this difference at all. Can you explain further Mr. Norman? Mr. O'Keefe, even into the Amtrak era when railroads held "turnkey" purchase of service agreements with Amtrak, Dining Car patrons would write their orders on a check and one copy of such would be picked up by the Waiter. The Steward would then come around and price the check. The NP was the one road I knew that would accept a verbal order from a patron. Interesting. I now better understand the origins of the huge "National Dining Car Service" slips used on Amtrak diners of the present. I've wondered for years how that practice came about--so that was it.